This tutorial explains how to convert a qpw file to a pdf document with the help of the novaPDF converter and from the Quattro Pro interface. To be able to have a successful conversion, download and install the novaPDF converter from the Download page if you do not have the application on your computer. 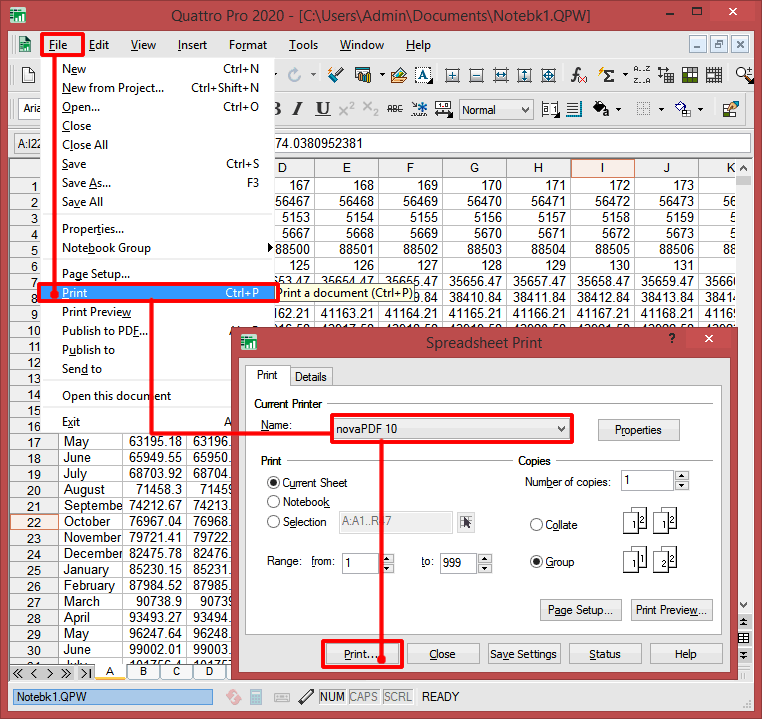 Quattro Pro is the spreadsheet program from the Corel WordPerfect Office Suite. It was designed as a contender for the Microsoft Office Excel and for the Lotus 1-2-3 alternatives. Quattro Pro has been around for many years and had versions for both DOS and Windows systems. QPW was not the original extension meant for the spreadsheet program but had a number of predecessors that are wb3, wb2, wb1, wq2 and wq1, depending on the company that owned the application during that time. Since Quattro Pro has been bought by Corel it was used on all the releases until today. The format includes multiple objects such as scripts, calculations, charts, has support for other data as well depending on the format and the sheet consists in two-dimensional cell grids. The format is mostly used in business environments or for personal finance. It is highly proprietary as no other application is capable of opening it, not even the Excel. However Quattro Pro includes exporting features to xls/xlsx if needed. This highly proprietary nature made the file format very difficult to view and handle if the person does not have Quattro Pro installed. This is why a conversion to a PDF document is highly recommended because of the document's popularity, portability and archiving standard and the capability of being accessed on mobile devices of needed. Also using a PDF printer driver such as novaPDF for the conversion adds useful features to the PDF such as signatures, enhanced security, merging, overlays, bookmarks, watermarks and even the possibility of sending and sharing the document on the fly over the email. First open the file by clicking on File->Open or using the Ctrl+O combination. Click on Print and select where you want the PDF file saved with the options you've selected.